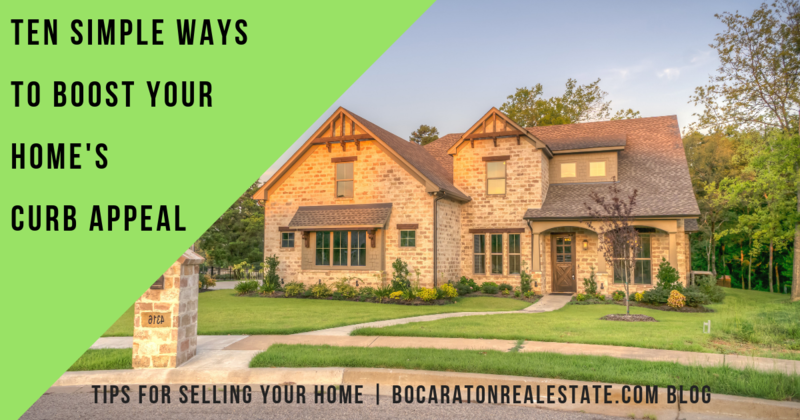 When listing your home for sale, your basic goals are generally: 1) to attract potential home buyers and, 2) to sell your home for the best price possible (usually, as quickly as possible). We all know that first impressions matter, especially in real estate, so it is no surprise that the path to a quick sale at top dollar begins with creating great “curb appeal” for your home. The general appearance of a home’s exterior can be very telling of what one can expect to find on the other side of the door, and often determines whether or not buyers will want to take a look inside. If it’s been a while since you last evaluated your home’s curb appeal or you haven’t even considered it, you may want to walk or drive by your house and take a good look at it from the street with an unbiased, critical eye. Next, ask yourself, “what would a stranger or potential home buyer first notice about my home?” Would they see an inviting, well-maintained exterior and lawn, or would they immediately notice neglected maintenance and areas with major room for improvement? 1. Give your front door a facelift. A fresh coat of paint or stain on the front door can make the entrance to your home look clean and inviting. Consider using a bright paint color that contrasts well with your home’s exterior. Red, blue, and yellow are each great options that can make your door and home really stand out. Or, you could use a nice glossy black paint or a natural wood stain if your home has a more traditional or classic design. Creating an inviting entryway goes a long way when it comes to making a good first impression on potential home buyers. Having a nicely groomed lawn with well-maintained landscaping improves not only the general appearance of your home but also suggests to buyers that the home's interior has been properly cared for as well. Start with the grass, ensuring that there are no dead patches or bare dirt areas. Next, focus on removing any dead bushes and trimming those that are overgrown. Another area you should always update when selling your home is the mulch. A fresh layer of mulch can completely transform the exterior of your home, as can adding pops of color using different plants & flowers. Landscaping improvements can be as basic or complex as you like, depending on time, budget, and the existing landscaping at your home. Be sure to replace outdoor light fixtures that are broken or look like they have seen better days. You may be surprised how much a new front porch light can improve the overall appearance of your home. If you are on a tight budget and don’t want to purchase new light fixtures, a fresh coat of spray paint is a quick and inexpensive way to make your existing fixtures look new again. At the very least, be sure to replace all exterior lightbulbs that are no longer working. 4. Revamp your patio or front porch. Adding a couple of well-placed planters, some tasteful outdoor furniture, or even a relaxing front porch swing can make the front of your home feel more welcoming. Also, don’t forget to add a fresh new welcome mat at the front door to greet prospective home buyers. Fixing up your front porch or patio will not only increase the attractiveness of your home but will also provide a new outdoor living space for you to enjoy. Making sure that your windows are nice and clean — both inside and out — is very important when trying to maximize your home’s curb appeal. Dirty windows can make a home look dated and run down, so it is well worth the time and effort it takes to make them sparkle. Don't allow dirty windows to get in the way of a great view. 6. Remove excess lawn ornaments. Keep it simple. Reduce the number of lawn ornaments around your home and remove those that you will want to take with you when you leave. Though you may absolutely adore the large colony of garden gnomes that you have collected over the last 15 years, it is possible that they will distract potential home buyers from noticing other positive aspects of your home's exterior. For the sake of curb appeal, less is definitely more when it comes to lawn ornaments. 7. Paint or replace the house numbers. Make sure your street numbers are neatly displayed and visible. You can quickly freshen them up with a new coat of paint or replace them with brand new numbers. House numbers are available in a wide variety of sizes, fonts, and styles, and can typically be found at your local hardware store. Replacing your house numbers and/or relocating them all together can give the front of your house a fresh new look. Use a pressure washer (or hire someone) to clean your home's exterior & all outdoor surfaces. A fresh, clean driveway and sidewalk are much more welcoming than those that are dirty or stained. The same goes for your home’s siding, front porch, and garage doors. Pressure washing is a quick and easy way to give the exterior of your home and surrounding areas a sparkling, “like new” feeling. 9. Store equipment & tools out of sight. Yes, it’s true. Nobody wants to see the equipment & tools that you use to maintain your property. Garbage cans, hoses, lawn mowers, shovels, and other maintenance items should be stored in their proper locations. On a related note, it is also recommended that you clean out & organize your garage. Though the interior of your garage doesn’t technically impact the curb appeal of your home (as long as the door is closed), it is a good idea to get rid of any clutter & non-essential items that are just taking up space. You want your garage to appear as open and spacious as possible to prospective buyers. Getting a new mailbox or sprucing up your current mailbox can have a dramatic impact on your home’s overall curb appeal. If your mailbox is broken and beyond repair, it's time for an upgrade. Otherwise, adding a new coat of paint to match your front door can really make your home stand out. You can also add some shrubbery or flowers at the base of the mailbox to add some color and interest. These are just ten of the many steps you can take to improve the curb appeal of your home when you are getting ready to sell. Your real estate agent will also have a list of specific suggestions to help get your home ready for the market. By tackling a few (or all) of these easy-to-do projects, your home will soon boast the curb appeal it needs to make a great first impression on potential buyers, putting you on the fast track toward a quick & successful sale. Do you have any other suggestions or tips for improving curb appeal that are not included in this list? We would love to hear your ideas, so feel free to share in the comments section below.